Tomorrow at 2:00 PM at the Wal-Mart on 7451 McCart Ave., Fort Worth, TX, we are gathering to educate customers about the struggle our brothers and sisters who work for Nabisco are experiencing, and why we should all be boycotting Nabisco snacks made in Mexico. The Texas AFL-CIO, AFL-CIO and the BCTGM Union has organized this day of action nationally, with a presence of union members, activists, and community supporters at more than 100 stores across the country. We invite you to participate in our Texas action! Last year Nabisco and corporate Mondelez International decided to send production of Oreos and other popular Nabisco snacks from one of its five union bakeries in the United States across the border into Mexico. They did this for no other reason than they could exploit low wage, unprotected labor in Mexico, viciously cut their production costs, and then send those Oreos, Ritz Crackers, and other snacks back to the US to be sold for exactly the same price. Mondelez/Nabisco made the decision to lay off 600 union bakers in Chicago and send those jobs to Salinas, Mexico, where workers are paid reportedly close to $1 per hour with no benefits other than a bus ride to work. 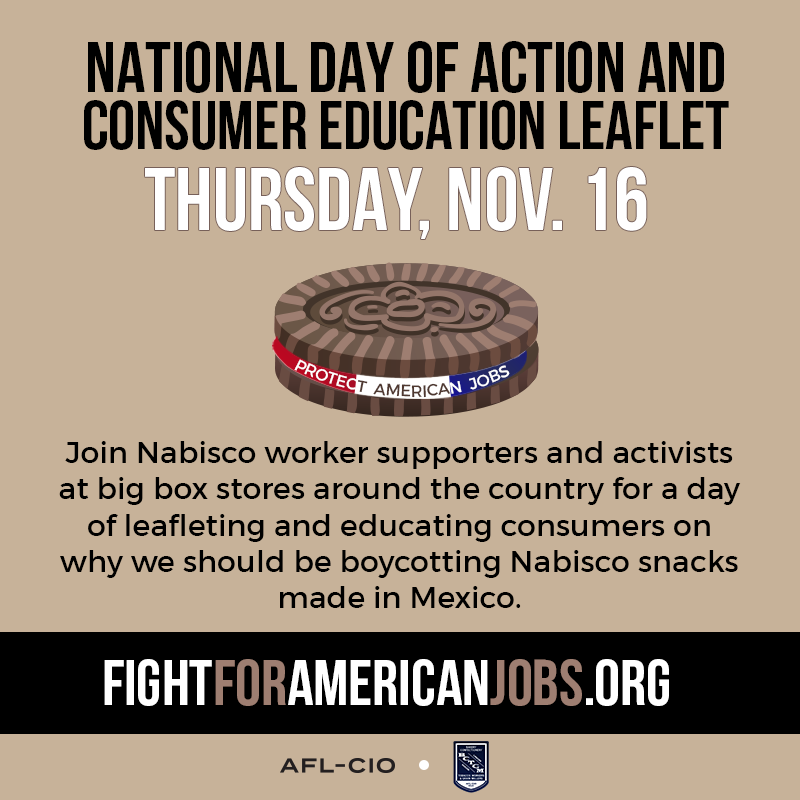 Tomorrow we’re urging our fellow Americans to hit this destructive company at the cash register and BOYCOTT Nabisco snacks made in Mexico! We look forward to you joining us tomorrow. Can't join us tomorrow? No worries - join the action from your smartphone or computer. Check Out the Nabisco Social Media Toolkit and have fun on Facebook/Twitter.